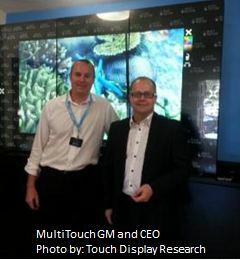 October 2014 - Touch Display Research, Inc.
Today, we were invited and attended MultiTouch Ltd.’s event in Silicon Valley, California. MultiTouch Ltd. was founded in 2007 with headquarter in Finland. In 2009 it opened an office in Silicon Valley, recently they moved to this new office in Los Gatos. We had a chance to meet with their CEO, Mr. Petri Martikainen and General Manager, Mr. Timo Korpela. The reason that MultiTouch calls their technology MultiTaction is to emphasize that it’s more than multi-touch; their technology could sense IR pen, objects, 2D barcode, and unlimited finger touch. Analysis and comparison with large size projected capacitive touch panel will be found in our “Touch and Emerging Display” October 2014 report. 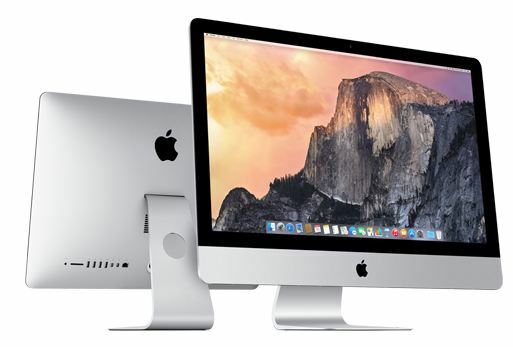 This entry was posted in Active Pen, Company News, Displays, Touch screens and tagged large touch screen, MultiTaction, MultiTouch, Touch screen on October 9, 2014 by jennycolegrove. This week, Cambrios announced its new generation silver nanowire. The new silver nanowire is thinner than DNA, which is about 2nm. Cambrios claims silver nanowire is leaving behind other ITO-replacement technologies such as metal mesh. At the same time, touch panel manufacturer, Henghao Technology, indicated they’ve adopted silver nanowire on the One Film Solution (OFS) touch panels. 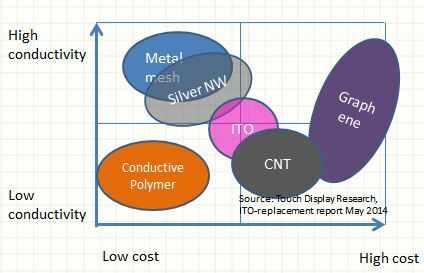 In the Touch Display Research “ITO-replacement report”, we profiles over 220 companies and research institutes working on advanced transparent conductive (TC) materials and provides a detailed analysis of metal mesh, silver nanowire, carbon nano tube (CNT), conductive polymer, graphene, and other technologies. Touch Display Research forecasts that the non-ITO transparent conductor market will reach $8.1 billion by 2021. One Film Solution and flexible touch screen will be analyzed in our “Touch and Emerging Display” monthly report. This entry was posted in Flexible touch screen, ITO replacement, Touch screens and tagged Cambrios, Henghao, ITO Replacement, metal mesh, One Film Solution (OFS), silver nanowire on October 7, 2014 by jennycolegrove.